Hey all! If you follow me on Facebook, you might have seen me post about trying Baby Foot for the first time. So many of you were interested in it that I captured my journey on Snapchat. I didn't take proper pictures, but I saved all my Snaps. I'm a little hesitant to post this since feet are an issue for some. If you want see some gross foot peeling pictures, keep on reading. If you have an aversion to feet, do not continue reading this post. Baby Foot is an exfoliating foot peel that's meant to remove rough and hardened skin from your feet. It's a gel applied to the foot by wearing plastic booties. It's super simple to use as seen in the picture. The gel has a great mix of natural extracts that help to aid in the exfoliation. Click this picture to enlarge for the ingredient list. If you have really sensitive skin, this might not be with you. Now, on to the Snapchat pictures! I soaked my feet before hand by taking a nice long bath. By softening the skin, the gel can soak into the feet better. The box says to soak for 1 hour, but Amazon reviews suggested 2 hours. I split the difference and went with 1.5 hours before washing my feet. Don't mind the socks under the coffee table. Someone at my house likes to kick off his socks. I don't name any names. Be careful when walking in the booties. It was so slippery and I had to put on my dude's shoes to get to the bathroom. I also had to ask him to help me walk to the bathroom and take them off. I washed my feet in the bathtub and used my regular body wash to get it all off. I didn't scrub or do anything extra. Again, be careful! Your feet will be really slippery. I don't have a bathmat in my shower so I threw down a hand towel so I had something to stand on. At first, I nearly broke my neck because my foot felt like it was covered in goo. Four days went by without any progress. The box says to wait 5-7 days. After four, I felt like nothing was going to happen. On day five, I woke up to this! I was so excited to see change. I should have worn socks to bed because all that missing dead skin was now on my sheets. The box also says not to forcibly remove the peeling skin. I only peeled off what was easy to remove. If it was still attached to my foot, I could tell I was going to rip off new skin. OUCH. Don't do that! My left heel was pretty thick. You can see where I peeled some of it away, but there was a lot of stubborn callused skin. I felt like this was never going to come off. If took a few more days for it to come loose. Also on day 6, I took a bath to soak my feet again. It softened all the dead peeling skin and make it a lot easier to remove. Again, I only removed the hanging pieces of skin. You really don't want to remove more than that or you'll cause soreness. This really grossed out my dude. He hates feet to begin with and this just took the cake. He didn't want anything to do with me during this process. It took a week to really get going. I think the last night's bath helped move it along. It was really weird when the skin between my toes started peeling. At this point, I was having fun peeling off the skin. I know that might be gross, but whatever. Nearly all the dead skin on the bottom of my feet was gone by day ten. All the big calluses and rough spots - GONE. This is also when my feet started to really itch. 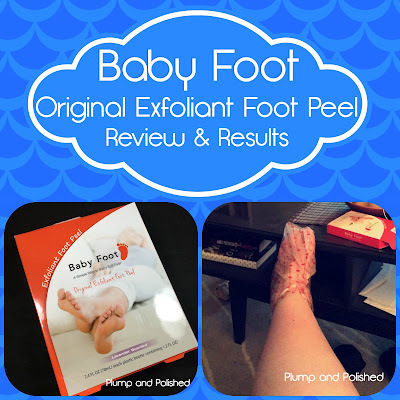 The thin skin on the top of my feet started to peel, but it was more like patchy scaly spots. The skin around my toenails and my cuticles started to peel, too. So, it just got more itchy at this point. If I remember correctly, I took a bath this night to get most of it off. I apologize for not having more pictures. Definitely wear socks to bed! You'll leave flakes of skin everywhere if you don't. This was also on day 12. As you can see, the bottom of my feet look great. Baby Foot did it's job and gave me super soft feet. It took a few more days for the tops of my feet to finish peeling. Two weeks out, and I was good as new. I can't get over how smooth and soft my feet feel and look. My dude was even pleasantly surprised. Maybe I can get him to give me a foot massage now. I won't hold my breath, but it's a possibility. He's just glad that my feet are scratchy anymore. I didn't experience any soreness or tenderness during the process. I thought removing my calluses might make my feet work during a long shift, but I didn't have any problems at all. Overall, I'm a huge fan of Baby Foot. I can see myself using it again in the future. I'm thinking twice a year. I'm actually going to buy it for my sisters and boyfriend. Everyone needs to try this out! My feet are so ready for summer. Have you tried this out or are you planning to now? At first, I was really anxious and nervous to try it out, but I'm glad I did. Let me know your experience! I bought Baby Foot from Amazon.